One of the greatest strengths of the MovNat community is the women who are a part of it. Every day, women all around the world and from all walks of life demonstrate the power and universality of natural movement fitness. Here at MovNat HQ, we are encouraged, inspired, and sometimes awestruck by the women we meet and the stories we hear from our community. 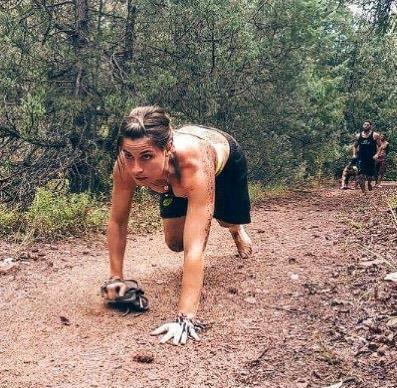 One of those inspiring women is MovNat’s very own, Abby Corriveau, who is one of our esteemed Team Instructors. 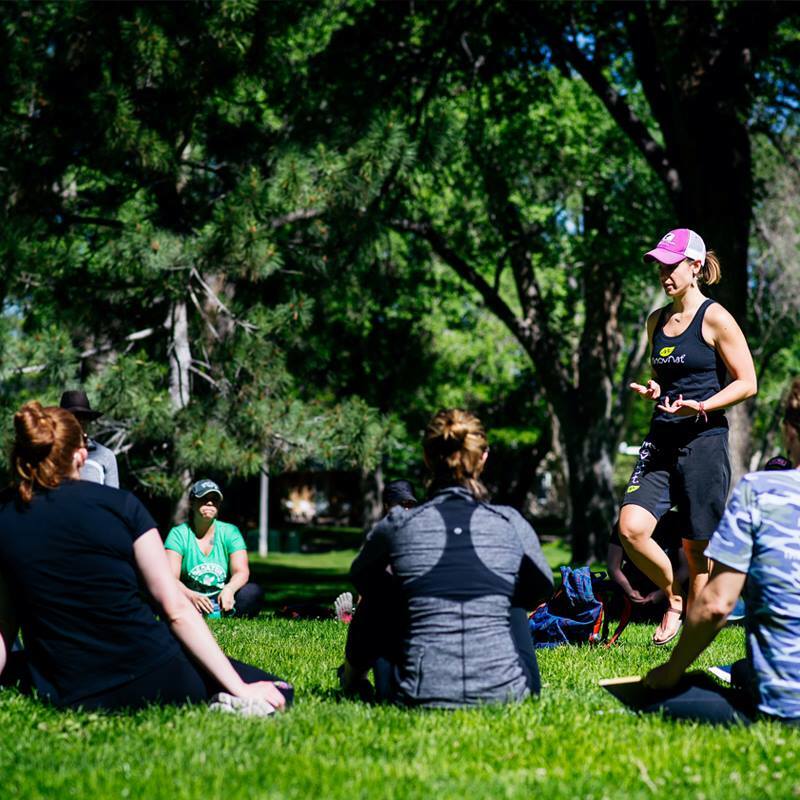 Abby walks the talk, leads from the front, and teaches women how to transcend fitness norms and to discover their strength, health, and full potential through the practice of natural movement. She’s been an invaluable part of our Team for the past few years, and today, we’re happy to present this interview so that you can get to know her better. 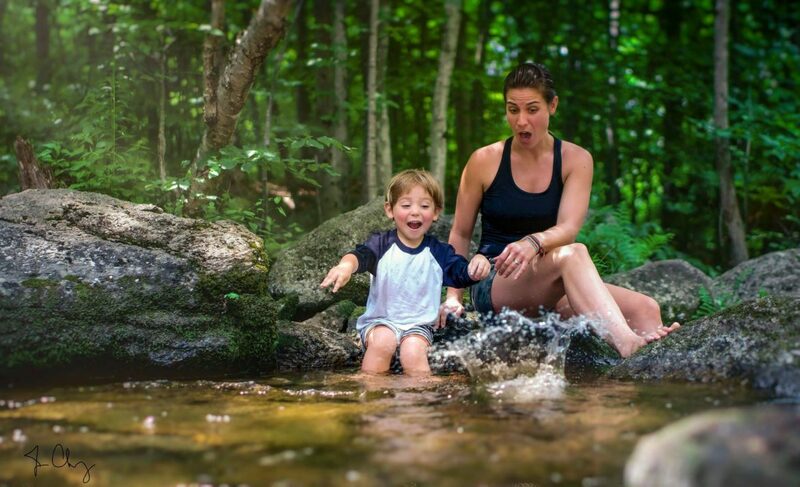 We hope her story will inspire you to pursue all that natural movement has to offer. MovNat: Can you tell us a little about yourself, your background, and what you do today? Abby: I’ve been in the fitness world since 2005. I started working at the front desk of a Gold’s gym with very little experience or knowledge about “structured exercise.” Over the last decade I’ve explored different approaches to movement/fitness/exercise such as hardstyle kettlebell training, powerlifting, strength training, Olympic lifting, bodybuilding, yoga, meditation, Katy Bowman’s Restorative Exercise, and MovNat. I’ve taken bits and pieces from each movement chapter and today I’ve developed a lovely relationship integrating movement and lifestyle using these methods while spending an ample amount of time outdoors as well. Moving and interacting with nature was something I’ve done since I was a young girl and something that I still do. Today I live in New Hampshire with my 4-year-old son. I am currently a full-time student in massage school and am excited to incorporate the therapeutic benefits of touch with the fitness approaches I use, specifically for women who are overcoming traumas in their lives. Why MovNat? Have you always been into fitness? What attracted you to it? When I was first introduced to MovNat with Erwan in Mexico I realized how out of touch I had become with the innocence of my childhood days spent moving all day outdoors. He reminded me that movement is greater than the box I had generally confined myself with linear programs and goals (weight loss, muscle gain, flexibility, strength, etc). As a trainer and as a woman (and new mother) I had equated my “fitness” to how much I could squat, how fast I could run, and what my body composition measurements were. I never thought about the conditioning of my feet, the importance of ground movement, the empowerment found in climbing up and over a bar (not just a pull-up). I was exposed to an unlimited world of movement and how to mindfully interact with the world around me. For me, MovNat was a paradigm shift that I felt in my bones. I felt like it was my duty to come back and share it with others. Movement isn’t just a check off the “to-do” list. It’s an integral part of living. Obviously, you’re not just a MovNat enthusiast. You’re a Level 3 Certified Trainer and one of our Team Instructors. You’ve really gone deep into this method. How has MovNat changed your life? Oh man, like I mentioned in the last question. MovNat exposed me to a world of movement filled with endless possibilities. I felt like it bridged my “fitness” world with my day-to-day lifestyle unlike any other method or system out there. It’s a lifer for sure. There will always be a purpose to keep the teachings of MovNat in my life. Can you tell us about any other health and fitness approaches you tried in the past and the kind of results you had in the past? What’s different about MovNat? I’ve tried many different fitness approaches from bodybuilding to hardstyle kettlebell training. Whatever fitness goal I set I’d see results based off specific programs created for those goals. I still use aspects of every fitness approach I’ve used in the past but MovNat is the one approach that compliments and supports all the other ones while also being a stand-alone system that I hadn’t experienced from other fitness approaches. I like to swing bells, curl dumbbells, climb trees, run barefoot, do downward dog and inversions. I see value in these approaches. MovNat simply aligns closer to my core values and lifestyle preferences. What are some of the biggest benefits MovNat has provided for you personally? You don’t need a ton of equipment or a gym membership. You can do it anywhere! It’s also been a fun way to interact more with my 4 year old son. He has developed a lot of confidence in different skills like jumping, climbing, and balancing that he has learned from watching me. That’s pretty cool. How do women, in general, stand to benefit from MovNat? I’ve seen women get into MovNat and build badass confidence in themselves after they achieve something that at first seems scary or impossible. For example, seeing a woman jump from one rock to another adds a whole new level of confidence and empowerment than just jumping onto a box. They feel like they can competently move in different environments and overcome obstacles. A box is a great start to master a movement like a jump. It’s more controlled and you feel safer. But when they take to a wild environment their eyes light up and you can see their confidence and victory radiate through their body language and facial expression. As a coach, it’s one of the proudest moments and totally makes me fired up to continue coaching women to practice natural movement. How do you, personally, use MovNat? What does your training look like in day to day life? I live in New Hampshire and the days are short and there’s like 12 feet of snow outside, LOL. Well maybe not that much but there is a ton. So a lot of my training is now indoors. I devote a daily ground movement practice and I typically do it first thing in the morning before my son wakes up. I roll out my mat, connect to my breath, and then move in and out of different seated positions, kneeling positions, and a blend of yoga postures. These daily practices help me to do a quick self-check-in and keep my joints supple during the cold months. About 3-4 days per week I either train at home or a small gym and include more strength movements like climbing, pressing, get-ups, and squats using weights. For you, is MovNat just a different way of training. Or, are there other lifestyle implications, too? I think the reason why I love MovNat is because it is more lifestyle for me than other fitness approaches. MovNat has helped me to scan my environment for opportunities to move and interact with it. It has taught me that my physicality has a greater purpose than just personal fitness goals. It holds me accountable to always do my best to be ready for anything. We aren’t immortal or immune to injury but MovNat has helped me to feel confident in my physical ability in real world situations. Any advice for busy Mom’s who would love to get into MovNat, but aren’t sure how to start and don’t have a lot of free time? I am with you! LOL. Yes, I teach MovNat but I am first a single-mom and full time massage student. So I totally get it. Personally, the daily ground movement has helped me tremendously. Some mornings I get 30 minutes some mornings I only get 5. Some mornings I choose sleep. :-) My point is, find a time in the day that works best for you and only you know what that time is. Don’t worry about the duration, just commit to moving. I literally roll out of bed, turn on my space heater and start moving in my pajamas. I like Katy Bowman’s #stackyourlife approach. Scan your daily routine for movement opportunities. Don’t compare yourself to how others do it. Do it your way and be proud of that. What are some simple and practical changes someone could make to their training or daily life to begin exploring MovNat? I can’t emphasize enough about ground movement. Different seated positions, rocking, and locomotion’s like crawling are lost in the fitness world so I think we are missing a lot of good stuff without a relationship with the ground. So, if you are new to MovNat and want to start exploring what it’s all about, I recommend starting with ground movements. They are a game changer! Could you share a favorite combo workout? If you don’t have something to climb on, you can throw in a jump variation instead. Okay, how about a few rapid fire questions…Favorite movement? I love the leg swing up. It’s super empowering. Most proud MovNat achievement? Passing my level 3 certification and getting my first tuck pop-up. Next training goal? I want to go on longer treks this summer so for me its building up endurance and carries. I want to apply all the hard work I’ve put in the last few years to pass the certifications into my lifestyle. Last question: is there anything you’d like to share with women who might be nervous or hesitant about trying MovNat? Honestly, do it. Go in with the butterflies and nerves and know that just like many new experiences something will blow your mind and something may not meet your expectations. Don’t be attached to the outcome, just go in with an open mind and heart. You were born with these instinctual abilities; with mindful practice you’ll be able to do it! Thank you for this exceptional interview, Abby! 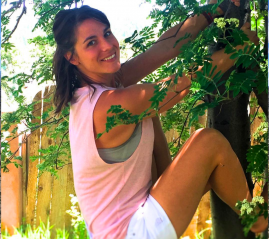 Bio: Abby Corriveau is a MovNat Team Instructor and Level 3 Certified Trainer (MCT III) who teaches Natural Movement workshops and certifications specifically for women. Her mission is to empower women to discover their true nature and highest potential for strong, healthy living through Natural Movement. She lives in New Hampshire with her son and is currently enrolled in massage school with a vision of integrating bodywork with her clients, specifically women. You can learn more about her on her website https://www.abbyclark.me. Or, join the MovNat Women’s Facebook group to connect with Abby and other women in the MovNat community. Want some Help Getting Started With MovNat? 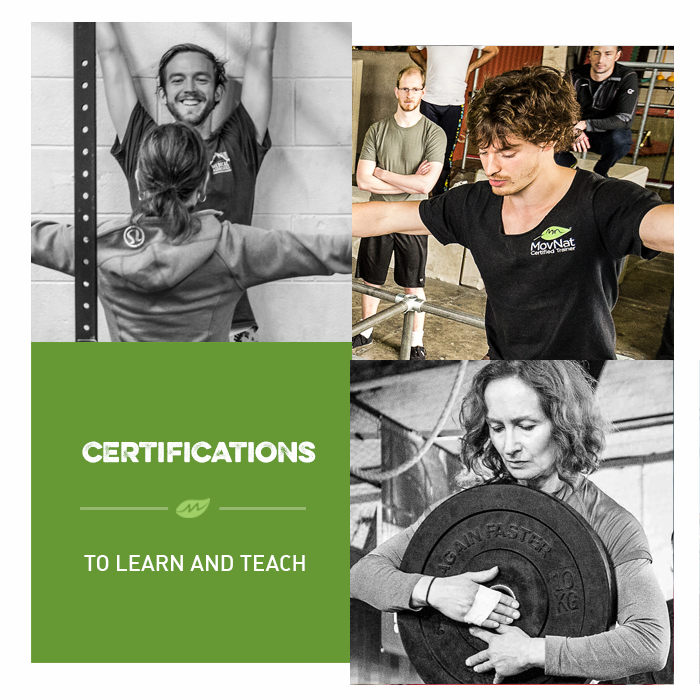 If you’d like to empower yourself, explore your potential, and learn all about natural movement fitness from one of the best, please sign up for one of our upcoming Women’s Certifications or Women’s Workshops, where you can learn first-hand from Abby. Space is limited, and these all-women events have historically sold out well in advance. Most people feel that they should be more physically active. Some even recognize the incredible value of natural movement training. But they struggle with actually implementing it into their daily lives.